Whether you are moving in Fort Lauderdale or nationwide, the right mover makes all the difference. When families and businesses are looking for movers in Fort Lauderdale to trust, My Guys Moving & Storage has the experience and the professionally trained movers to handle the details. Moving companies Fort Lauderdale customers choose have to be ready for a variety of conditions, such as navigating tight staircases with bulky items. We make your move easy by handling the heavy lifting while you focus on getting settled in your new neighborhood. We offer full service moving solutions that are affordable, dependable and adaptable to your schedule—we can begin a job in the morning or afternoon for your convenience. My Guys Moving - Friendly, Affordable, Dependable! Local & long distance moving to the entire U.S.
Moving in the Fort Lauderdale area can be a hassle, so let us take the stress out of it with our fast, convenient service. My Guys Moving & Storage can help you whether you are moving a single item, moving a whole house, or moving a business. You’ll be amazed at the ways our experienced, professionally trained guys go the extra mile to make sure your relocation goes smoothly. When you choose a moving service, you want to make sure that your home and possessions are protected against damage. Each one of the My Guys Moving team has been extensively trained in all aspects of professional moving. We have a specialized program to minimize claims, and use runners and padding to keep your floors looking great. Our proven techniques also protect upholstered and wooden furniture. If you have valuable items, such as big screen TVs or marble table tops, we can build a custom crate to transport it safely. With full-service packing and moving services available, our team can do it all! Moving your office can be a challenge for both owners and employees—let MY GUYS provide the labor and expertise for your project. Businesses have trusted us for their office moves and corporate relocations because we customize our services to your project requirements and work within your schedule. Our experts can quickly deliver and assemble modular furniture, safely move your company’s business equipment, and provide logistics to minimize disruption. Would you like to know how MY GUYS can provide your moving services? Call 954-437-9669 to speak to One of the Guys. In a hurry? You can get a free moving quote using the form on this page. We look forward to making your move successful and easy! 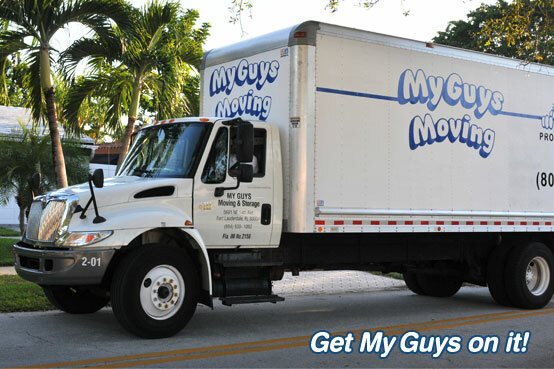 My Guys Moving—the movers Fort Lauderdale residents rely on and consistent rate as one of the best moving companies in Fort Lauderdale!